Outlook PST Consolidation tool is built to combine data files together to generate a common storage for manageability. The application supports both the variants of PST, ANSI and Unicode while generating an output in Unicode PST for larger storage capacity. Microsoft Outlook PST Consolidation Utility supports Outlook 2016, 2013, 2010, 2007, 2003 versions for joining various small PST files together. 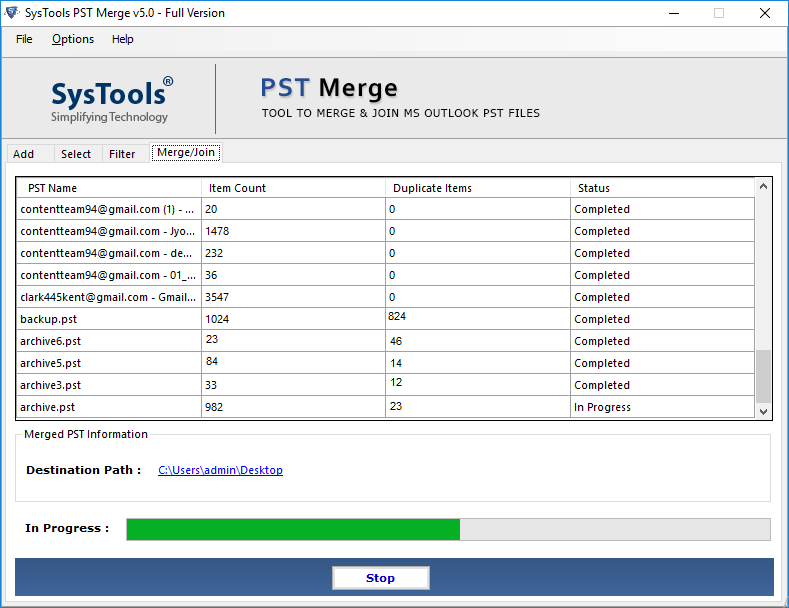 Merge PST Aplication supports MS Windows 2000, 2003, 2008, XP, Vista, or Windows 7/8/8.1/10, 2008/2012 (32-bit & 64-bit) versions to combine Outlook PST files into one single file. 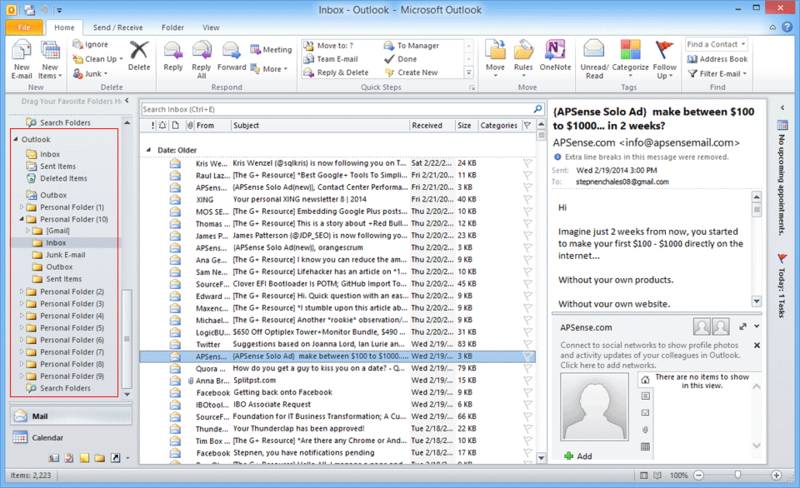 Multiple Outlook Data Files can be merged together using this Outlook PST file combiner software. 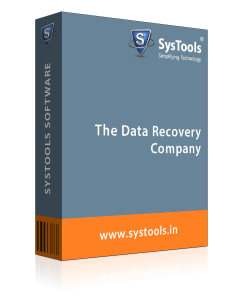 The application is built to render the easiest way of combining the data of a multitude of PST files into a common output for an easily manageable storage. 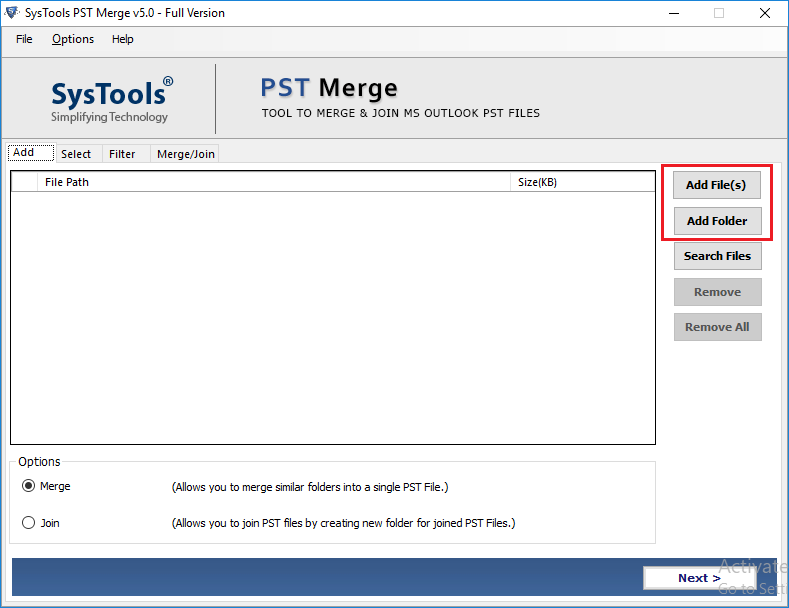 The PST Merge Tool features multiple modes for combining PST files, which includes; Join and Merge PST. 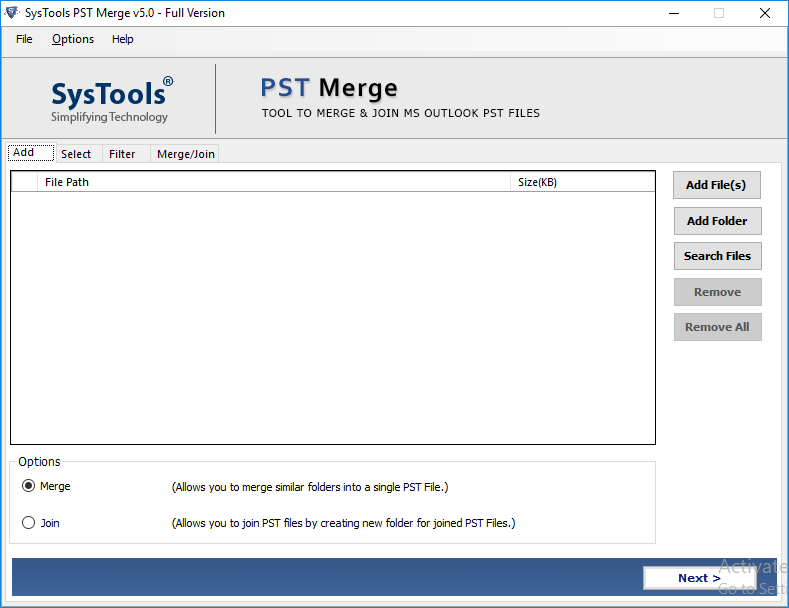 Users can either combine common folders of PST using Merge PST or combine all files under individual folders within a common data file using Join PST. This very option is provided for merging the contacts only from various .pst files processed using the product. The PST Merge Software features ‘Contacts Only’ combine option besides the other two options for specific requirements. The product allows the user to join only contacts. There is no size limitation imposed on the quantity of data to be merged using PST file combiner utility. Users can merge a total of five or fifty PST files and the PST files Combine software performance won’t be affected by the quantity. There is no limit on the size or quantity of PST files. 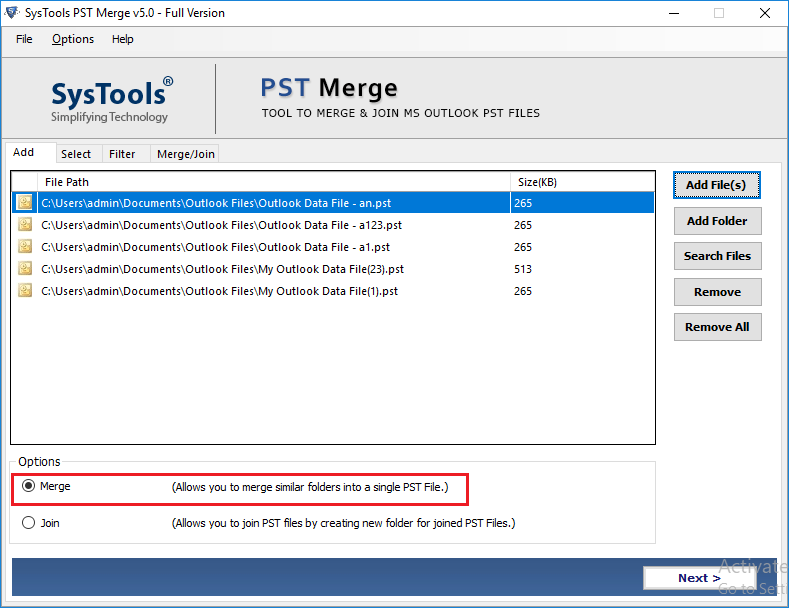 Outlook generates its data file in two different variants and the PST merge Tool supports both equally. Consolidating of Outlook PST files, ANSI formatted or Unicode formatted remains the same for the software. No compatibility issue will be surfaced with this reason. When it combine PST files, you can further customize the process according to enhance the procedure of merging PST data. Users can exclude either Deleted Items folder or Duplicate Items from being merged, or both while merging PST files. It also joins or combines all folders of multiple PST files. 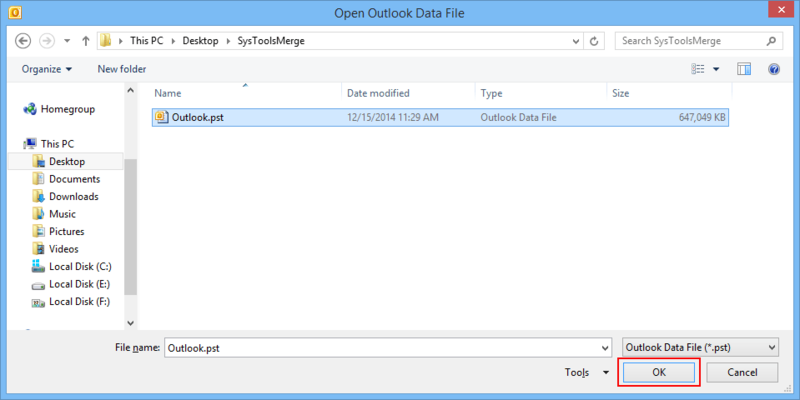 How to Merge Multiple Outlook PST files into One? Step 2 : If you want to merge pst files one by one, click on Add file option. If you want to merge several PST files, So click on Add folder. The product Scans the files and displays them with the file name and source path. Step 3 : The PST File Consolidation software gives the various options to Combine PST files join, merge & merge contacts. You also have advanced option to select the Remove Duplicates and Exclude the Deleted Items. Step 5 : The PST Merge Software initiates the merge operation and shows the current merging process on the displaying Merge Pane. The Hierarchical structure of the PST data, that could be seen with the exact processing status. Step 6 : When the process gets complete, a dialog box shows the confirmation of Merge Operation Successful. Step 8 : If you want to see the information of the PST File, Open Microsoft Outlook then Go to File option select the Open option, then Click on Open Outlook pst Data File. Q. 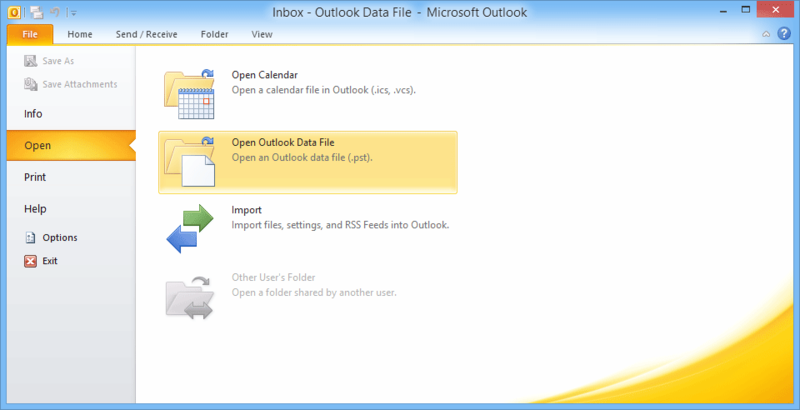 How to move data from Outlook 2010 profiles to archive?
" I am in need of moving more than just a couple of emails from two of the Outlook 2010 profiles I maintain into an old archive. However, the archive seems to be filling up and won’t be able to add up any more data. What to do?" Q.Other than drag and drop, how else can I merge the contents of PST files in Outlook 2007? Ans: Instead of going the long way, you can always choose to download and install the PST Consolidation Software. This application is the finest of its category in the industry that enables to combine multiple PST files together without having to do more than just commanding the application to perform the procedure. Q. Is there a way to merge several PST file into one? 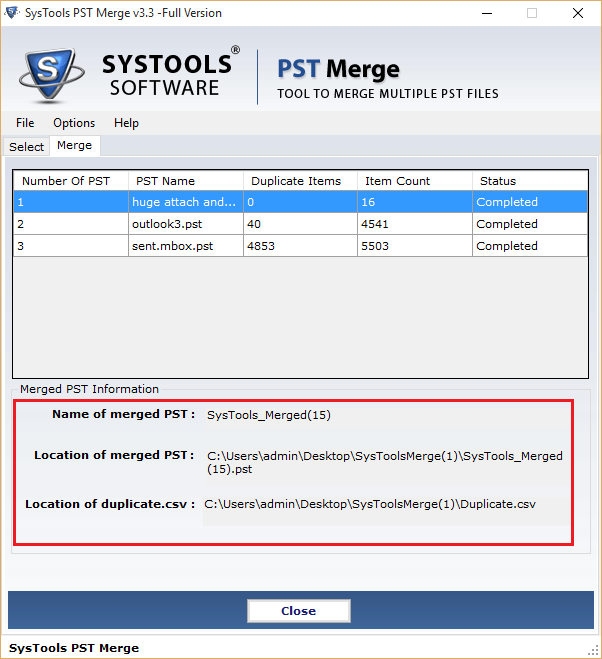 Ans: The best way to combine the data of multiple PST files is to use the PST Merge Tool. The application is one of the best multiple PST file combiners that simplifies the procedure by allowing you to combine PST files in batch or via individual selection. Note: Outlook PST Merge Tool will get delivered on your registered email id, within few minutes after placing the order. Amongst all the tools, I found PST Merge Tool the most suitable and I was probably right with the decision. This application made it so easy for me to get all the data merged into just one PST file that is of Unicode formatting which enabled me to have larger storage. Thankfully, I didn’t have to run from pillars to posts in order to get the best solution in the market. I simply searched the web for a product that could merge multiple PST files and found PST Merge Utility as one of the many suggestions. Now because its functions suited all my criteria, I was able to quickly make the decision.